As Indian cricket fans who learned to love the game in the 1990s and became mature connoisseurs of it in 2000s, we had the unrivalled good luck to watch both Sachin Tendulkar and Rahul Dravid in their prime. Watching them bat together was the most pleasurable experience for a cricket lovers. The ‘Little Master’ and ‘The Wall’ were two men who, among all the players of that era, came closest to achieving batting perfection. Obviously, Sachin Tendulkar is regarded as the better batsman among the two, but it feels almost sinful to get into a comparison as that requires pronouncing Rahul Dravid to be less good – a sacrilege of the highest order for any Indian cricket fan of our generation. But cricket is a game that ensures its greatest practitioners get their own unique distinctions which allow them to be remembered and revered without being overshadowed by contemporaries. The same is the case with Dravid. India’s greatest No. 3 batsmen may not have reached all those dizzying heights attained by his more celebrated teammate. But in certain spheres of cricketing achievements, he has got the better of Tendulkar. Let’s pay tribute to this giant by recounting those accomplishments which even the ‘god of cricket’ doesn’t have. It has often been said that there is no batting record or achievement that Sachin Tendulkar doesn’t possess. However, that is far from the truth. One of the batting milestones which the great man couldn’t reach was scoring 500 runs in a Test series. He came close though. In the 2007-08 series in Australia, Sachin missed the coveted mark by just 7 runs. But ‘The Wall’ did reach that height and that too, twice. 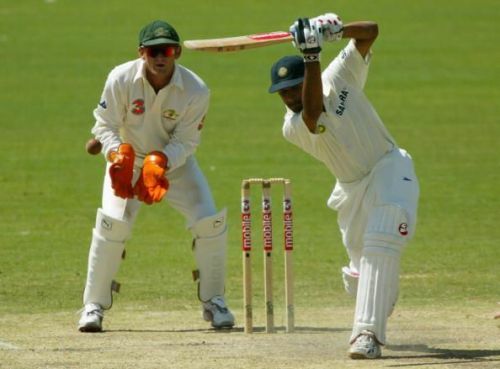 In the 2003-04 tour of Australia, Dravid played the leading role for India in their brilliant performance of drawing the 4-match series by scoring 619 runs. Around one-and-a-half years earlier, he had managed the same feat in England. Thanks to three consecutive hundreds, including a double ton, Dravid accumulated 602 runs in the 4-Test series against the hosts. The fact that he managed to break not just the 500, but even the 600 barrier in both Australia and England speaks volumes of the greatness that this legend from Bengaluru possessed. He could easily have breached the 500 mark a third time, during India’s tour to the West Indies in 2006, when he was the captain of the team, but fell short by just four runs. It’s clear that Dravid was relentless when he struck good form.